Jack Ashton is confident AFC Rushden & Diamonds can “finish the job this time” as they charge towards promotion. 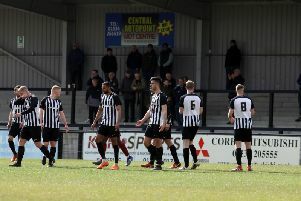 Diamonds go into this weekend’s home clash with Aylesbury with an eight-point advantage at the top of the Evo-Stik South League East while, more importantly, they sit nine points clear of third-placed Hayes & Yeading United with the first target being to secure one of the two automatic promotion spots. Having missed out in the lottery of the play-offs in the last two seasons, Andy Peaks and his players are keen to ensure they aren’t needed this time. And, having bounced back from a shock 2-1 defeat at Egham Town with a 6-0 thrashing of Thame United and a 2-0 victory at Barton Rovers last weekend, Diamonds are now closing in on sealing a place in Step Three next season. And central defender Ashton is confident they will do what needs to be done. He said: “At Egham, I think seven or eight of us could hold our hands up and say we weren’t good enough on the day. “We were never going to go unbeaten until the end of the season but we went on an incredible run and we can proud of that. “It was just important that we bounced back properly and we have responded with two clean sheets and two convincing wins so we did what we needed to do. “We know we are in a good position and first and foremost, we want to get promotion. “But being so close to the end of the season and being in the position we are in, I think it’s fair to say that we have our minds on winning the league. “We have come so close in the last couple of years and I guess that’s always in the back of your mind. But I think we have learned from those experiences. Ashton has enjoyed a triumphant return this season and is now playing a key role in the promotion push having been out for over a year with a serious knee injury. And, having received a ‘kick up the backside’ following the defeat at Egham, he was delighted to grab his first goal of the season to wrap up last Saturday’s win at Barton. “I wasn’t at the races at Egham,” he added. “Since I came back from injury, the pitches have been similar and I think it all caught up with my body on that day. “But it give me a kick up the backside! “I had a couple of chances at Egham and didn’t take them so it was great to get the goal last weekend to wrap up a good win and performance from the lads."